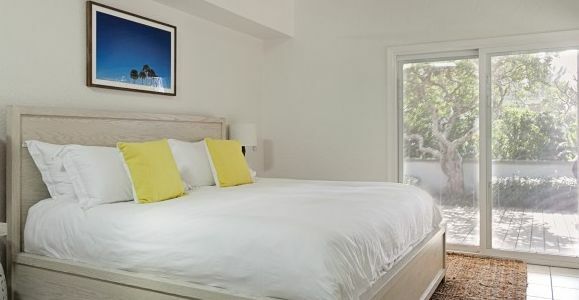 Located on the top floor of the Inn, the Gulfstream comes complete with a king bed, cathedral ceiling, kitchenette, bathroom with shower, and wraparound balcony with Gulf and sunset views. This room sleeps a maximum of two people. Kitchenette features a SMEG mini fridge, Breville multi function oven, electric kettle, and plenty of dishes and glasses. Pack your beach snacks in the small cooler provided and head for the sand….or your spacious wraparound balcony! Your facilities were wonderful. We certainly enjoyed the peaceful but friendly surroundings at Pass a Grille. We now have a new favorite beach! In fact, our daughter is planning on having pictures taken at St. Pete beach for her upcoming wedding next April. Thank you again for making our stay so enjoyable. It exceeded our expectations for sure. It’s immaculate and absolutely gorgeous inside. We really enjoyed our quiet stay and view of the water from the deck and would highly recommend the inn to others as well. Thank you for making our short get away so terrific!